Enveloped. Usually rounded but can be filamentous The virions are 80-120 nm in diameter. Viral RNA polymerase (PB1, PB2 and PA) transcribes one mRNA from each genome segment. Transcription is primed by cap cleaved from cellular mRNAS by Cap snatching. mRNA are polyadenylated by the viral polymerase stuttering on a poly U track. MP and NS mRNA can be alternately spliced, giving rise to mRNA coding for M2 and NEP proteins. Some strains can express M42 from the M segment . PB1 mRNA encode three proteins by leaky scanning: PB1, N40 and PB1-F2 . Pa-X protein is translated by ribosomal frameshift on the PA gene. Leaky scanning may produces N-truncated PA proteins, namely PA-N155 and PA-N182 . PB2-S1 would be an alternative splicing from PB2 gene (unpublished 1/1/15) . Endosome acidification induces fusion of the virus membrane with the vesicle membrane; encapsidated RNA segments migrate to the nucleus. Recent studies have shown that the Human traches and alvoeli epithelial cells are mainly expressing alpha 2,6 sialic acids, when only alveoli are expressing alpha 2,3 sialic acids . 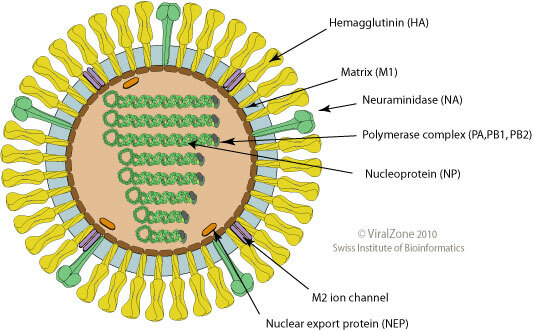 This could explain why avian viruses could succesfully infect humans only when breathed at high doses. Indeed the trachea and bronchioles are much easier to reach than the alveoli for aerial-transmitted virus. These results are debated, and investigations are needed to understand the whole picture .